A: Pours a nice copper color with a thin foamy head, and moderate lacing emanating from the laser etching on my glass. S: Aroma is very thin, with a noticeable hint of creamed corn. Instead of an esterful presentation of fruit and spices, I am dealt a mess of overcooked veggies and cardboard. T: Low flavor, to appeal to the masses, with plenty of cardboard and corn to go around. Not only is it not flavorful, it is offensive. O: A pathetic brew that doesn't deserve to associate itself with its great country. At least Stella, while light, is well composed. This brew is a mess. Appearance: Pours a clear, copper-hued body with a small, short-lived, white head. Smell: Unfortunately, the aroma presented is a tad anemic, smelling only modestly of day-old baked loaf bread, delicately toasted sugars, and far-off, distant stonefruits. Taste: Chiefly bready maltiness accented with touches of notably sweet sugary. Small hint of grain. Light fruitiness akin to apricots. Teensy pinch of baking spices. Subtle, faintly leafy hop character with ample bitterness to provide some balance. Finishes dry, crisp, and clean. Mouthfeel: Medium-thin body. Medium-high carbonation. 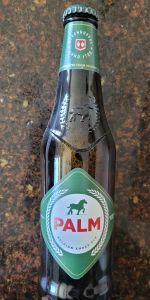 Drinkability: Palm Not-Particularly-Speciale is a very simple brew, lacking many of the rich complexities, but it does excel at being well balanced and easily drinkable. Light amber colored beer, 1/3" white head, average retention. Some toasted pale malts, not much in the way of hops or yeast from this one to stand out. Taste was super mild, mild carbonation, mild malt, mild hopping. Almost watery thin. I can't really see who would want this, doesn't do what belgian or American pale ales should be doing. At least no off flavors. I don't know what is going on with these ratings, but this ale is better than a 3.3 average. I had a 4 pack over a year and they were all good beers. Nicely malty, the yeast imparts an orangey-flavor and aroma, slightly bitter. Reviewed in Roger Protz' CAMRA classic "300 Beers To Try Before You Die!" MJ's 1999 "Guide" didn't rate it, but said "Palm ale has a bright, amber color, a light to medium body, a fruity, bittersweet aroma and a tart finish." MJ's Great Beers" talks almost 4 pages about Palm's process, personalities and business. Palm Speciale is listed on the "1001" and deserves to be there if only to counter such a harsh average rating by you guys. A - The beer pours with half a finger of off-white foam on top of an amber colored body with excellent clarity. The head settles quickly and leaves light lace on the glass. S - Slightly tart, toasty malt with lots of musty, herbal European hops. T - Bready malt notes up front with some toasty character. Musty hop flavors show up in the middle and some thin, light caramel notes add character as well. Things finish up with more bready malt and moderate bitterness. D - Not terribly impressive, it looks good but it really goes downhill from there. The aroma is very lightly malty with a good dose of musty hops. I tend to associate this hop profile more with British ales, but it is not entirely out of place in a Belgian. The flavor is disappointing with a weak malt profile that turns a bit sour in the finish and hops that are, again, a bit musty for the style. Not a very good beer and not one that I would drink again. A: The beer is clear amber in color and poured with a finger high head that quickly died down. A light amount of carbonation is visible. S: There are aromas of earthy and grassy hops in the nose along with some notes of caramel malts. T: The taste has flavors of grainy malts with notes of caramel and hints of apples and sweetness. There is a slight amount of bitterness in the finish. M: It feels light- to medium-bodied and smooth on the palate with a moderate amount of carbonation. D: It isn't that difficult to drink this beer given its low alcohol content and light amount of bitterness. Had this on tap at EPCOT Food & Wine from the Belgium kiosk; part of the offered beer flight. Kind of dark for a Pale Ale nice amount of head on this one though. Smells a lot like a a cheap macro lager with a lot of dry grain. Taste isn't much better than the aroma, while drinking this I am again reminded of a cheap lager. Sweet grain like taste. Not a very good beer at all, would definitely pass on this one again. 330ml bottle, a single from Zyn in Calgary. This beer pours a crystal clear medium red-brick tinged amber hue, with one finger of densely foamy beige head, which leaves a low sinking iceberg profile of lace around the glass as it readily recedes. It smells of somewhat biscuity and grainy pale malt, a touch of sour caramel, mild corn husk - sort of un-Belgian, IMHO - and some earthy, leafy, and grassy hops. The taste is a sweet corn and barley malt mish-mash, doing no one any favours, but harmless at the same time, with some caramelized apple notes, mineralized honey, a hint of earthy yeast, and a bit of musty leafy hops echoing in the distance. The carbonation is mild, barely generating a basic frothiness, the body a wavering medium-light weight, plainly smooth, and generally ineffectual. It finishes off-dry, and a bit skunky, kind of a wonder-inducing occasion for a Belgian ale (but not for their lagers - bonjour, Mlle. Artois! ), as previously noted, but supported well enough by the adjunct-laden pale malt. Wow - the most American styled (in a particularly unflattering way) Belgian offering that I've ever tasted. Not worthy enough, though, to actually recommend beyond the curio factor, as Belgium has so much more better stuff to explore. Interesting beer. Nice color- deep gold almost amber. Hops contribute some bitterness but not much in the way of aroma. Reasonably sweet but not cloyingly so. Way less fizzy/ carbonated than most other Belgian brews. I kind of got some caramel/ butterscotch notes. Not a bad beer, just not good enough to recommend over a Delerium Tripel, say. Bottle in Amsterdam. From notes. A - Poured a slightly dark gold with good carbonation, a two finger fluffy white head that leaves just about no lacing, and has weak retention. Bright. S - Mild aroma. Hops, breadiness, and crystal type malts. T - Bready and very slightly hopped. A little caramel. Not all that strong. M - Medium to strong carbonation and a medium body with a sweet finish. O/D - Not too bad but not overly interesting. A standard beer with more complexity than North American 'macros' but not a whole lot to go on besides that. Nice. Crisp. Refreshing. Good. Not Memorable. Poured at the Sharp Edge Bistro On Penn, a crystal clear amber body with a white head fine even lacing. Aroma has a mild nuttiness with tame fruits, nice cereal grains with a pretty bland nose as a whole. Flavor wise is very much like any boring amber ale but with a heavy price tag in this case it was like 7.50 for a standard pour in a signature glass. Semi sweet grassy herbal hops a bit of caramel biscuit malt backing it all up let me down a very one dimensional snooze alert flavor profile. Mouthfeel is medium bodied light carbonation really no fireworks. Overall really not interesting enough to peak my interest ever again, a beer that is Belgian but the age of mass produced marketing campaign in Belgian ales. Poured from a brown 11.2 oz. bottle. Has an amber color with a 1/2 inch head. Smell is mild, some malts. Taste is also mild, a tad bitter, not a lot of flavor. Feels medium bodied in the mouth and has average drinkability. Overall this is a mediocre offering. From notes 10/31/11: Pours and orange copper with 1/2 inch of off-white, short-lived head that leaves no lace. Aroma: banana, delicate malt, yeast, honey and orange citrus notes. Taste: honey, fruit, sweet malt, banana. Finishes with citrus and a carbonation bite. This quarter-liter bottle was given to me by a co-worker who just got back from Belgium and brought me one of these and a fresh Delirium Tremens. Cool, but tiny bottle. I poured this into my Belgian tulip glass. With only 8 to 9 ounces to work with, I want to maximize aroma. It has a beautiful dark amber color. Thin head bubbles down pretty fast to a thin covering. Swirling the glass at different times during the tasting produces a small head fairly quickly. Aroma - Not Impressed. A very light malt aroma, rather faint, and not much else. Taste - Decent malt flavor, just a breath of sweetness. Although this has great bubbling in the head, the carbonation is rather low key in the mouth. Nice aftertaste, especially after it warms a bit, some woody notes and a very soft bitterness. Mouthfeel is smooth and just a touch oily. Makes it easy going down. Drinkability - All night long. I could throw down 12 of these no problem. 'Course, they're only quarter-liter bottles heh-heh, but this is a wonderful session beer. An unexpected find at a local after work watering hole. Tapped a copper color with a large 'Belgian head', long retention and great lacing. Aroma is simple but ample and fresh; bready malts, fruit notes and woody hopping. Flavour is unpretentious as well; big malts in the front, twiggy-spicy hopping compliments but allows malts to sit forward, middle has some fruit tones and earthyness, rich malt and fruity finish. A: Pours a clear honey amber with a large white head. Poor retention and little lacing. Carbonation is on the weak side. S: Malty with grains and some floral hops. Nothing special. T/M: Sweet and malty. smooth going down as it is a little watery, with a weak hop bite. Not that exciting. Low carbonation with an overall clean aftertaste. D: Not that great, yet nothing really that about it either. Just overall plain. For a pale ale it needs more hops. Very easy to drink, and I think worth a try.